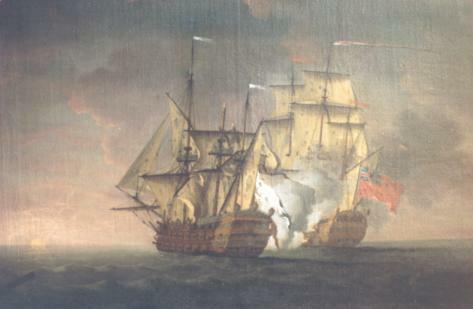 Swaine's canvas of the Monmouth's defeat of the Foudroyant, 1758, is a milestone in English naval action painting. It derives its style exclusively from Monamy, and resembles the works of van de Velde not a jot. It is also a great advance on Monamy's pioneering manner. Its composition is, until someone proves me wrong, entirely original in its disposition of the ships in combat, and it succeeds magnificently in its purpose. See also here for Francis Swaine. Having married Mary within five months of Monamy's death, Francis Swaine obviously took over the remains of the old man's studio. One of his first concerns was to issue a print of Monamy's last painting, the Nottingham takes the Mars. Swaine re-drew the composition, correcting the perspective of the bowsprit and jibsail. Although the basic research conclusively proving Francis Swaine's extremely close association with Peter Monamy was published over 25 years ago, it seems that decades have to pass before truth will out. And now, Sept 14, 2007, see here. Whatever the manner in which Monamy used the drawings of the van de Veldes, and the Kirkall mezzotints alleged to be after the Younger, it is perfectly clear that his collection was totally dispersed in the auction eighteen months after his death. Swaine was left with Mary, his mother-in-law Hannah, and a large number of half-finished canvases. He modelled himself entirely on his deceased father-in-law's painting style, which was finally brought to a peak in the painting shown at the head of this page. I would like to see a single canvas by Swaine showing the influence of van de Velde, on whose style the paintings "of all the English marine artists of the eighteenth century were formed". 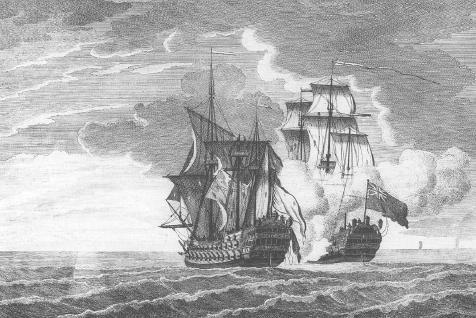 The plain evidence is that the only English marine painter who was demonstrably dependent on the van de Veldes was Charles Brooking. Scott, as argued elsewhere, scarcely merits the title of marine painter, although he exploited the drawings of the van de Veldes. Where and when was Francis Swaine born? One way of starting is to find out where the Swaine family name hails from. One guide is to remember that first names tend to repeat in the same families, during these times. Birth records give us the following array of Englishmen named Francis Swaine. Their occurrences are colour-co-ordinated by district. Yorkshire, Berkshire and London are the favoured areas. There are obviously several families, and one group seems to have branched out with the spelling Swan, sparsely represented above. It may be a fundamentally different name. The painter's family appears to have stuck fairly firmly with the spelling Swaine, at least by the turn of the 17th century. Candidates for the painter would be the christenings at St Botolph's and St Dunstan's in 1719 and 1725. See here for more on Swain(e) genealogy. On the other hand, there seems to have been some research that suggests there were two Francis Swain(e)s active in early 18th century London. At the same time, there is a lack of confidence that either of them were the painter; why, I do not know. At one time I would have settled for the St Botolph's Francis, baptised 22 June 1719. That would have made him 30 when he moved in on Mary Monamy, and 63 when he died. The other one, christened 1725, is still a possibility, in which case he would have been aged 57 when he died in 1782. Summer, 2007. If Francis was the Swain(e) born in 1719 he would have been 16 when he got a job as a Navy Office messenger lad. The NMM doesn't care to supply the slightest item of scholarly evidence for its statement that: "Soon after, Swaine rejected this employ in order to become a marine painter", but perhaps they have found a marine painting, signed Swaine and dated 1736. 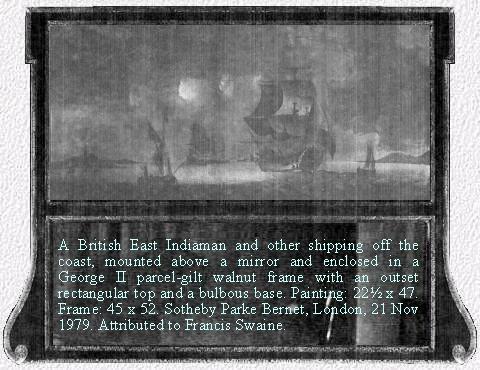 However, the idea that the Francis Swain(e) who was a Navy Office messenger is the same Francis Swaine who became a marine painter can be shelved. In fact, it can be totally discarded, in spite of the fact that not only is it categorically stated by the NMM, but also the ODNB, whose concern for biographical accuracy when it comes to C18th marine painters is nil. Francis Swain, the Navy Messenger, had progressed to Head Messenger in the Navy Office by 1755, when he sadly died, on October 10th. His will was proved "at London the seventh day of August in the year of Our Lord one thousand seven hundred and fifty six", and he left all his goods to his dear and loving wife Ann Swain. The couple lived in Whitechapel. Francis Swaine, the marine painter, however, was busily painting away through the 1760s and 1770s. It is virtually certain that this Swaine, marine painter, was born in 1725, and that his wife, Mary Monamy, was a little older than him. These data come from the IGI. Unusually, and remarkably, the age of Anna Maria Swaine at her christening is specifically give as "1". The date of her christening, 27 Jan 1750, would have been rendered in Old Style, and would today be recorded as 27 Jan 1751. However, if she was at least one year old in January 1751, she would have been born at the end of 1749 or very shortly afterwards. There is now no way of determining her exact date of birth, but since her parents were married on 29 June 1749, it seems possible her conception was pre-nuptial. See Swaine Genealogy. Allhallows was a church associated, to an extent, with City dignitaries. Mary Monamy may have married there by virtue of her parentage. Swaine must otherwise have been a parishioner of St Dunstan's, Stepney, at least until 1754. He is said to have lived later in Strutton Ground, Westminster, and then Chelsea.